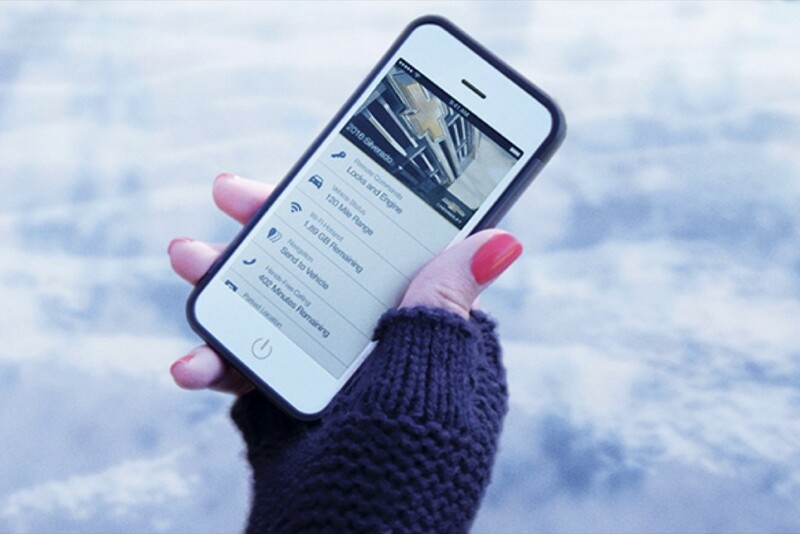 myChevrolet is a mobile app that provides remote vehicle access and information for Chevrolet vehicles. The myChevrolet app works with model year 2010 and newer Chevrolet vehicles. Compatibility of vehicle remote features vary as per the below table. Remote start requires the vehicle to be factory-equipped with remote start and automatic transmission. * Remote start feature not available. † Lifetime MPG is not available; Fuel Range is not available. * OnStar is an available feature. † Remote start feature not available. ** Lifetime MPG is not available, Fuel Range is not available. Running on a mobile device, such as a smartphone or tablet, the app connects to the OnStar data center using the Internet — either through a cellular network (like 3G or 4G) or through Wi-Fi. In the U.S., the carrier is Verizon Wireless on vehicles without 4G and AT&T on 4G-equipped vehicles. In China, the carrier is China Telecom. Upon receiving the command from the data center, the vehicle executes it and then responds using its built-in OnStar cellular connection, sending a signal to the data center over the Internet. For instance: it has successfully executed the remote start command. Upon receiving the reply from the vehicle, the data center then sends a final reply, which is dispatched to the vehicle as well as the user’s device. At this point, the device shows a successful “Your Vehicle Is Now Running” or unsuccessful “Unable to start vehicle” message. This same process is replicated for other commands, such as door lock/unlock, horn, lights, and vehicle information (such as tire pressure, gas mileage, range, etc). OnStar tells us that subsequent requests are faster than the first, since the connection to the vehicle is already open and active. Version 1 of the myChevrolet app was released in October 2010. Its functionality did not include any vehicle access features like remote door unlock or remote start. At that time, these were handled exclusively by the OnStar RemoteLink app. An icon for OnStar RemoteLink, known as OnStar MyLink at the time of the release of the myChevrolet app, launched the standalone OnStar app. In 2016, the myChevrolet app received a complete redesign as part of Version 3. The new app delivers an entirely new user interface and integrates vehicle control features previously available only in the OnStar RemoteLink app. Follow GM Authority’s coverage of myChevrolet app here: myChevrolet news.